I write frequently about how important our thoughts and words about and to ourselves–our daily affirmations–are to our joy. Remember, I consider our daily affirmations the truth we tell ourselves every day–within reason; we might be able to lie to our momma, but not to ourselves. I cannot tell myself after seven children (and honestly even before) I have a rock hard body and mathematically brilliant brain with a constantly pure heart, mind, and soul. That would be a foolish lie! 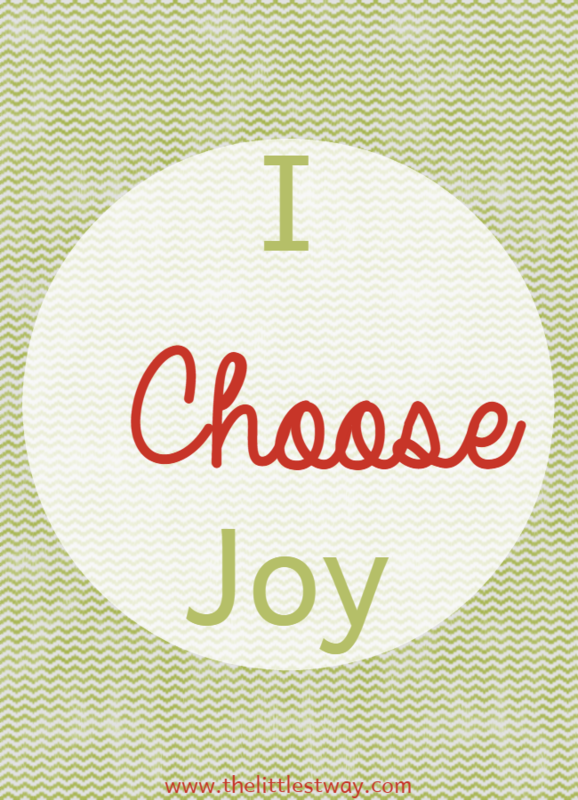 The nightly question, “Did I choose joy?” serves as a reminder to look back over my day and remember the joyful times. It also reminds me I can choose joy. It is entirely up to me and I am completely capable of making that choice. It was actually more of a battle cry than a declaration! My then three or four old sitting across from me coloring thought for a moment and then hollered, “I choose horses!” Although he was totally serious, that silly declaration broke through my gloomy, fight or flight attitude and turned my day around. So let’s talk about how we can choose joy. Some believe that joy is a conscious commitment to be happy, to have a sense of contentment for the moment, despite life’s challenges. Joy is an internal lasting emotional condition…Joy in the Biblical context, is not an emotion. It is not based on something positive happening in life, but is an attitude of the heart or spirit. So how do we choose joy? We make the decision to, regardless of the situation or circumstance. We choose eternal over earthly, infinite over temporary. Let me tell you a story about my mother-in-love who passed away ten years ago after a three month battle with Uterine cancer. She chose joy even though her situation was dire and her circumstances were painful. It’s Mother’s Day 2007 and she’s sitting in a recliner two of her grandsons moved into her bedroom. Her usually small frame has wasted away to thin, transparent, baggy skin hanging on brittle bones. Her weak smile shows signs of intense pain if you look close enough…but her eyes reveal a joy no one is humanly capable of in this situation; not on their own at least. Almost two months previous to this day, she was diagnosed with Uterine cancer, suddenly, out of the clear blue. And one day while helping her shower, I cried that her body was betraying her. The very same body which had held 8 precious lives until their birth-day, was now killing her. She touched my hand, “My body is not betraying me, Jenny,” she whispered. The conversation ended there. I wasn’t going to convince her it was and at that point, she wasn’t going to convince me it wasn’t. I both loved and hated her body at the same time that day. If it were not for her, for her body, I would not have my Chris. If not for her body at that moment, I wouldn’t be showering my sweet mother-in-love. She told me one day while I laid next to her that she had prayed she never got cancer. She then looked at the crucifix next to her bed we had bought her once we realized how sick she actually was. Eternal over earthly. Joy is a decision that looks to eternity while happiness seems only temporary. My mother-in-love always made us meet at some park to celebrate Mother’s Day. Sometimes the grass would be high and the playground equipment uncared for. The lunch cold and the wind whipping the tablecloth off along with plates and utensils. She would sit in an old lawn chair, when she wasn’t scooping potato salad, and laughed in her old lady cackle which I loved. And she smiled the whole time…she chose joy. But Mother’s Day 2007, the picnic had been moved to their driveway. The same driveway Chris knew his entire life. One by one, each family went in to see her sitting in the old burgundy recliner situated near the foot of the bed so she would be more comfortable as she greeted her large family of eight children and their families, one family at a time that Mother’s Day. A few of her boys, now grown men, wore their sunglasses inside. As they left her room, I could see the runaway tears; the ones that slipped past the UV protection meant to contain them. She was swollen, near death, and in constant pain. She weakly and bravely smiled. She chose joy. She made the decision to see beyond her situation and circumstances that day. She chose to see the whole lot of us that day, regardless of the physical exertion it took just to remain in an upright position, let alone smile or whisper words of love. She spent her last Mother’s Day at home, with her 8 children, in-laws, grandchildren, and great-grandchildren. She looked every single one of us in the eye and smiled…she chose joy. She chose joy as she faintly smiled through the pain of the cancer gnawing through her. I can choose joy and smile at my children as I cook their lunch when hunger pains make me want to act like a big ‘ol pain. She chose joy as she smiled and sat there talking to us through the literal pain of death. She chose joy and smiled when her big boys were dripping tears in their momma’s bedroom. I can choose joy and smile when my little one is dripping syrup across the kitchen floor or my bigs are dropping mud clumps. She chose joy when her momma body was being broken by cancer and each breath was hard. I can choose joy when my momma heart is being broken in two and each breath is hard. And then, every day this week–morning, noon and night–let’s tell ourselves, “I Choose Joy.” Repeating positive daily affirmations to ourselves will change the way we think about situations, people, ourselves and our life. And one day we can look back and recognize all the times we chose joy! Thank you for this beautiful post. It was needed today! Thank you, I needed this and it is beautiful. Thank you for sharing. I want to choose JOY too!! Do it! Choose joy again and again throughout the day until it becomes a habit–you won’t know what else to choose. I’m cheering for you!! Jenny, this was just beautiful! I appreciate your writing, because it is SO real and at the same time very encouraging! I can relate to the child who suddenly wants to chat when lights are going off and I am done with a capital D! That happens to me a lot, and it is so hard to choose joy in the moment! It is so hard to choose joy a lot of the time, but I love your reminder that joy doesn’t just come when everything is going well. We can’t wait around for it; we have to actively pursue it! Oh, I needed to hear this! I love that your child said “I choose horse” that is the sweetest thing. I have been loving the Christmas season, but definitely feeling stressed about it all. I choose joy today. I really needed to hear this today. I had a rough day and need to choose joy in spite of it. Thanks for the reminder! This is great, Jenny! I giggled out loud with the “I choose horse!” story. 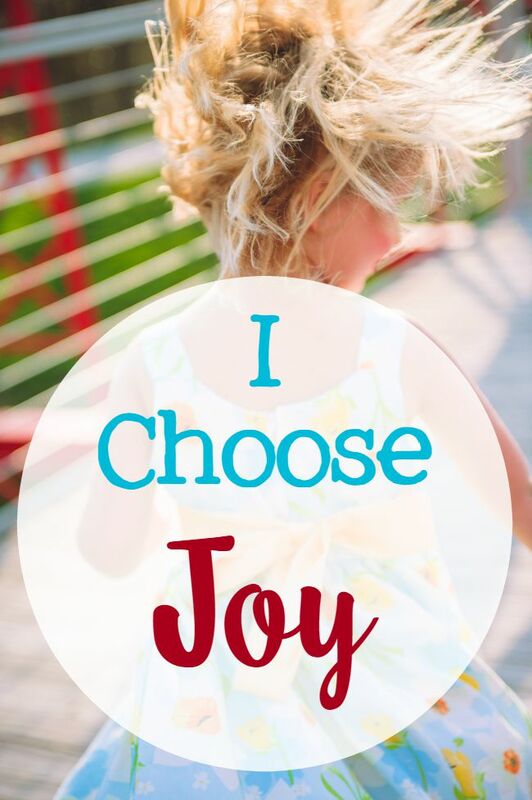 What a sweet and fun way to remember to choose joy daily– because yes, it is a choice! So appreciate your heart behind this post– needed to hear this in the midst of our current life storm. Thank you. What a beautiful story! My son’s birth-grandfather recently passed away and he was an example for me about choosing joy through it all. Thank you for sharing and thanks for the link to a daily examen- we’re not Catholic but I like the idea of reviewing your day as method for doing better the next day. Thanks for sharing through the Shine Blog Hop! So good. It is a battle cry some days! I choose horses too! Pinned your great images! Blessings this Christmas. I love the stories you shared in this, Jenny. The cute story of choosing horses and of your Mother-in-law choosing joy at the most difficult time of life. What a wonderful reminder that no matter our circumstances, we can always choose joy. Nothing impacts my life like living in the joy of the Lord. Circumstances change and happiness comes and goes, but the joy of the Lord is always with us. Thanks for sharing this. LOVE it! I just loved the way you applied the lessons of your mother-in-law’s story to your right now life. Really thought-provoking. I love the examen you are leading your kids through. It is so spacious and grace-granting with real room to grow. Inspiring. Thank you so much for sharing it with us. This is a wonderful reminder for how we should approach every single day! Thank you for this beautiful post and your mother in law’s story. It was deeply touching. Every now and then it’s good for me to be reminded of how little I have to complain about – and as you say – how “Joy” is a choice. She was a beautiful woman and we miss her. I wish my younger children could have gotten to know her. I love this post! Growing up my own momma would tell us girls to “find our Joy” when we were having a very rough day. I also have a hair clip with the word “Joy” on it that reminds me of those days so much. Joy can change everything. I am going to start using that, “Find your joy.” Great catch phrase! Thank you so much for sharing this beautiful story of love. And thank your husband for allowing you to. I want to smile too. And I want to mean it. You have such a beautiful way of sharing God’s undeniable truths. And that photo? Wow. Breathtaking. Thank you Michelle. It’s ok to smile sometimes even if we don’t mean it. I hope that when I choose to smile when I don’t really feel it, it will eventually become habit to smile period.